Today is 13th of March… exactly a year since my surgery which had ended my first life and started another, different one with a second partner – cancer. It’s been a year and I am still waking up in the middle of the night wondering has it all really happened or was it just a bad dream. On the Christmas Eve I said words which will stay in my mind forever: “I have a feeling that this is our last Christmas”. Tom hugged me and told me to stop saying that… but he also had a bad feeling. We never went back to this. Over Christmas break we rested and decided it was a good time to start thinking about second child. 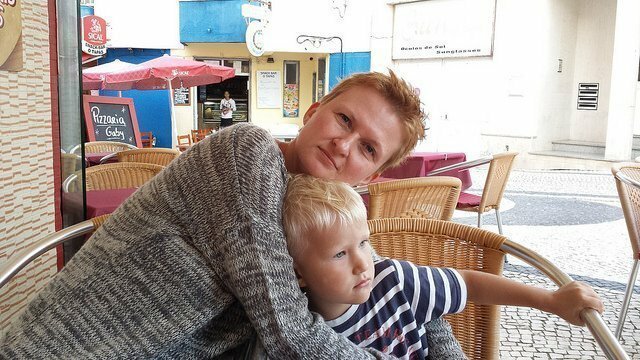 In January 2015 I flew with my 4 year old son to Poland to see my parents. As always, I went to see my dentist, my gynaecologist and to do a basic blood test. The gynaecology visit was supposed to be a routine one. I was more thinking about getting ready for the pregnancy. Before my son was born I had 2 miscarriages and I just wanted my doctor to check if everything was ok. Within 20 minutes my whole world collapsed. The gynaecologist found 3 cysts on my right ovary. My left one was badly damaged by previous endometriosis. Because of the sizes and location of these three cyst, the doctor told me that I had to consider removing my right ovary. That was harrowing. It meant I wasn’t going to have another child. I went back home and cried all night. I couldn’t come to terms with not having a second child, that my son will be only child. We always wanted two children. The next day brought even worse news… the blood markers CA125 and HE4 were strongly elevated. There was a suspicion of Ovarian Cancer. I was advised to start acting on it immediately. My doctor wanted me to go to the Oncology Hospital the next day. There is one close to my home town. I wanted to go back to Ireland. Something was telling me to go back. Maybe it were memories of previous experiences with the Irish health system. I know… you hear a lot of complaints about it… we actually heard a lot of complaints about both Irish and Polish health systems and I experienced both. I wanted to go back to Ireland. I came back to Ireland after a week. The roller coaster began. I visited 2 consultants. One, who helped me enormously with my previous problems with my left ovary, and one in St. James’s Hospital. Both doctors were rather reassuring that it was most likely another case of endometriosis. I had this before and it likes to come back. Unfortunately CT and MRI scans confirmed many small areas of inflammation in pelvic and abdominal areas. My doctor recommended a diagnostic laparoscopy during which he wanted to take biopsies. It took place on the 2nd of March in the St. James’s Hospital. I was home the same day… not for long though. The results from biopsies came back with the crushing news. 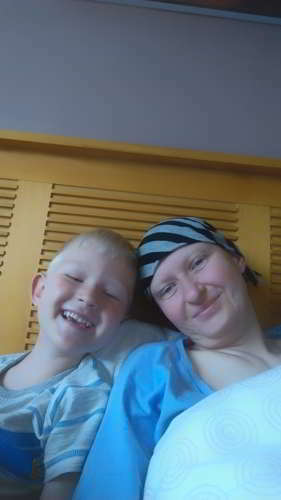 I had stage IIIC Ovarian Cancer. I had to have extensive surgery. My doctor went through the details of it and it seemed so abstract. Everything was happening so fast, from the first routine visit to the diagnosis. I was in a state of shock every day. Each day I was waiting. Waiting was the worst. I vaguely remember the day before the surgery. I checked in to the ward on Thursday afternoon. I remember tests, conversations with doctors and nurses… I still thought I was dreaming that all of this was not happening. The surgery took place on Friday the 13th of March. It took almost 8 hours. 8 hours of cutting, scraping and removing the smallest bits of the disease from majority of my internal organs. My uterus, my ovaries, my fallopian tubes, my gallbladder and appendix were removed. My bladder, liver, diaphragm were scraped of the disease. My bowel had to be cut in two places to remove bits which were too badly infected. My ribs had to be broken to gain better access to my liver. I lost so much blood that I needed a transfusion once during operation and second the day after. Today I don’t remember the pain but still when I am reading my hospital files I can’t believe one can actually survive such interference. Only now I realize why everyone in the hospital was so attentive, why they were saying I was so brave and so strong. My doctor later told me that actually this surgery should have been done in two stages. Only because he thought I was strong and to minimise the risk of further spreading of the disease, as well as the fact that he wanted me to start chemo as soon as possible, he decided to carry on. He saved my life. I stayed at the hospital over 2 weeks. 2 long weeks during which I went through hell. Countless number of tubes and probes coming in and out of my body. Tons of painkillers and panic, fear that it will begin to hurt again. 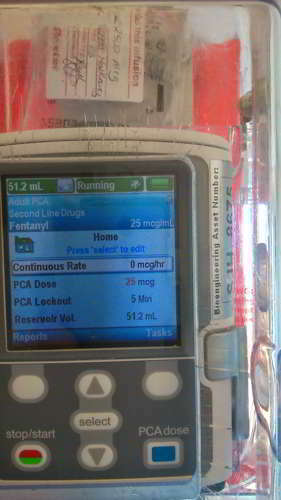 I had an epidural, I had morphine patch I had a pump which was supplying a constant flow of morphine and also I had a remote which I could use every 5 minutes for extra dose and I was getting painkillers intravenously as well. Painkillers were relieving the pain but the amount and strength were causing bad side effects among which the worst were very vivid dreams. Scary dreams. I was afraid to fall asleep. I thought I was losing my mind. I was leaving Post-Its beside my bed that if anyone notices me sleeping they had to wake me up immediately. I hadn’t sleep for almost a week. It happened twice that one of the painkillers ran out and I had to wait for a “top-up”. Unbearable pain as if I was being ripped apart, my screams and begging for more painkillers. 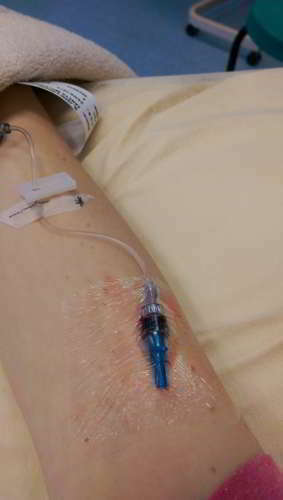 For the first week I was relying on all the tubes but after a week they started to pull them out. I started to get up, take my first steps and first bites of food. Every move, every breath and bite were causing pain. My doctor was visiting me every day and was saying how well I was doing but I felt otherwise. I thought this was my end; that I was not going to leave this hospital ever. I missed my son, my small four year old boy who knew nothing about all this and was asking why mummy wasn’t home. At last, on the 26th of March I was brought home. I was terrified. In hospital I could press a button and one of the nurses was there for me. I could call for a doctor and ask any question to explain any doubts I had. At home I was on my own… almost. Everything fell on Tom’s shoulders. Work, home, looking after me, our boy, cleaning, cooking, shopping. He was very brave. My parents came to help and to support us. The medicines I had to take made me see strange things, talk to myself and made me almost absent. 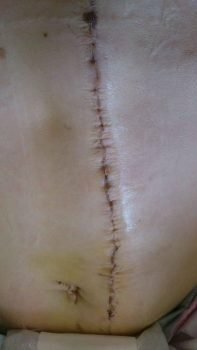 Additionally they were causing bad constipation which was a big problem after my bowel was cut and stitched back together in two places. Every bowel movement was an agonizing pain. I was given 5 weeks to rest and get better before the chemo. Although physically I was getting better and better, I was still in a lot of pain but mentally I was in bits. My oncologist decided to push chemo away for 2 weeks and send me to psychologist for a consultation. That was some kind of a breakthrough. I am very glad now that I went there. It helped me a lot. Mainly in dealing with pain. I feel now I couldn’t do it without it. 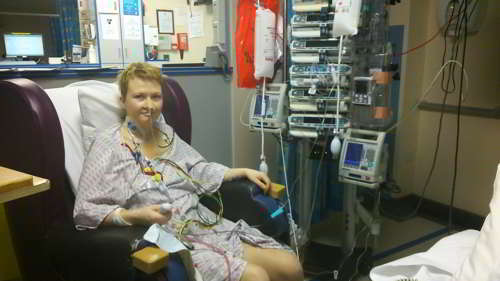 My chemotherapy started on the 30th of April, 6 sessions, 6 hours each. I was terrified again. The number of people there, bald heads and this specific grey shade of skin. Like living ghosts connected to poison which was supposed to kill cancer but it was killing them as well. The sessions themselves weren’t that bad. The worst was the first week after. Within 24 hours after each chemo Tom had to give me an injection with a medicine which was supposed to stimulate my bone marrow to produce white blood cells to fight cancer and any infections. The side effect of this was bone pain, bad bone pain, lasting about 6 – 7 days and always with the same progress. It started in the largest bones – my hips and legs – progressing upwards into smaller bones and ending in my hands and fingers. Sometimes I felt like just chopping them off. My hair started to fall out after the first chemo. I was really afraid of hair loss. For me it was something that really made me sick. Tom shaved my head. I didn’t want to wait and see it falling out in batches. We did it together, I shaved his and he shaved mine. My eyebrows and eyelashes fell out after third chemo. I was sick. 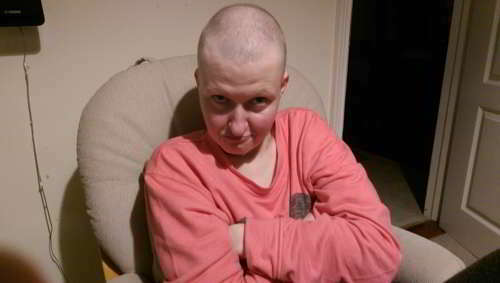 Losing my hair was one of the worse things that ever happened to me. I felt ugly, I felt I was no longer a woman. I started to look for cancer headwear. I did not want a wig. Wigs are creepy… I was looking for something comfortable, lightweight and a little bit stylish. 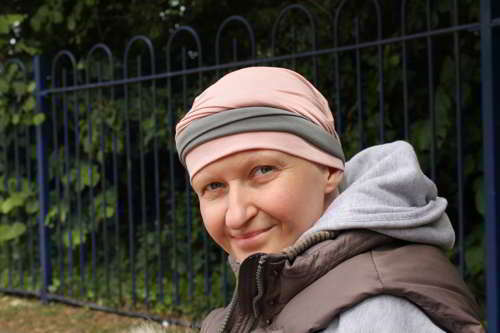 I wanted my cancer headwear to turn me back into a woman. I was looking for scarves and turbans which would not be as obviously cancer related. I found it difficult to find something suitable. The ones I saw on the internet were ordinary and in few styles. This made me think for the first time about my own business. I finished my chemo in the beginning of September. I was still on loads of tablets, painkillers and tablets from my psychologist. After chemo I got all possible side effects. I thought “this is not a life I wanted to live”. My stomach was starting to give up, my body was weak. If I wasn’t under the care of my psychologist I would not have made it. I once thought I was not able to fight. But I was fighting and I fought hard. I am extremely grateful for the excellent care and attention I received from doctors and nurses in St. James’s Hospital. This past year brought a lot of pain and suffering to me and to my family. I don’t regret this though. I am happy to be alive. And I am happy I was given a chance to still be a part of my son’s life. He started school just after I finished my chemo. I still can’t believe it happened. I know the statistics and I am still scared. Before my sickness I was hardworking person. I worked in a bank and I was giving myself over to this job. This caused me a lot of stress and plenty of worries. Now I try to live a calmer, slower life and I try to appreciate every day. Life is so fragile. I don’t know if I will cheat this cancer and live beyond 5 years. I want to believe that it all happened for a reason, that there was a purpose in all this I have been through. It changed me. It made me stronger. It changed my way of thinking and the way I perceive this world. I have to live and I can’t be worrying about all those things I can do nothing about. People sympathise with you when you are sick. They complement you when you are recovering and starting to look better. They don’t know though what’s sitting in your head. Cancer leaves a terrible mark. Chemo leaves many side effects. I am sterile, I am going through a menopause, I am on antidepressants and I am still in pain… but I live. 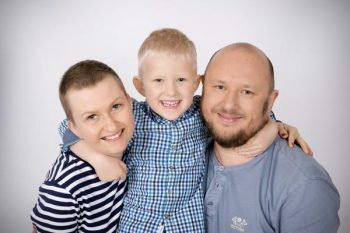 I was always saying to Tom that if I ever had cancer I would not survive the disease and chemotherapy as well as my mum did. I have my little business now. It keeps my mind occupied and my thoughts away from the past year. It’s quite exciting as well. I am selling cancer headwear. Scarves, hats and turbans which will hopefully help other women the way mine helped me. I am scared of the disease coming back. It seems unthinkable that I could go through this again but, if it comes to it, I know I will fight. I have no choice. I have to live for my family. I won’t give up. This entry was posted in Cancer, Cancer Survivors, Hair loss, Health, Stories. Bookmark the permalink. That was the most honest and open account of what a battle with cancer looks like, that I have ever read, and I am completely in awe of your strength and resilience. 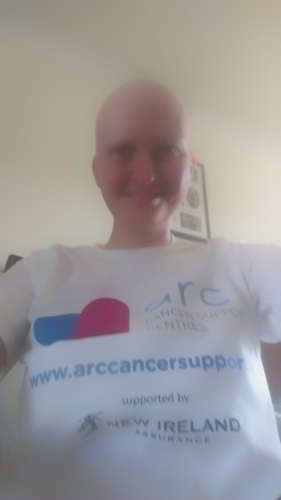 As a trained counsellor I try and help people talk about their difficult life experiences, and I believe that your account will help many to be more honest about the tremendous challenge that illness and specifically cancer can bring. Your courage in sharing your experience is boundless. You are simply amazing and you have a beautiful family. Best wishes for good health, happiness and recovery. 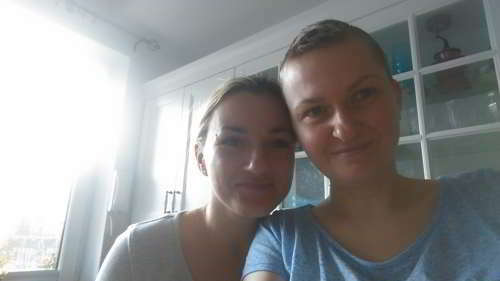 As a friend of Zaneta’s I can truly say she is one of the most strongest, determined and bravest people I know. I saw how Zaneta went from being diagnosed to undertaking a unimaginable tough road to recovery. All throughout this Zaneta maintained as normal a family life as possible with the help of her wonderful supportive husband, Tom, for her beautiful son Szymek. I believe the love they all had for each other kept her string. To see Zaneta coming through this and share her story is inspirational. Zaneta thank u for your kind words. Your story is an inspiration. Your products look fantastic. I will definitely be shopping soon. Thank you for sharing your story. I am fighting stage 3 uterine cancer and have just lost my hair. I am approaching my third chemo and am having the very same side effects as you described. I feel much the same as you about the way I look and wigs. I thought my only good features were my eyebrows and eyelashes that I had left. I am sad to think that I will lose them too. I have had a hard time explaining the pain from chemo to friends and family, you said it perfectly! Thank you for that! You have fought an amazing battle, and have lifted those of us that are still in the fight.